These come through town now and again. What do you buy there that's of use to our hobby? I haunt the Walmart section that sells that a lot. Best thing is a flush cutting pliers, for doing head transplants on 28mm figures. Back when I did a lot of GASLIGHT modeling, there was a lot of useful tchotchkes there. All sorts of mini-tools, fine wire, magnifying loups… My wife makes jewelry, and I'm forever nicking her tools, especially a pair of pliers with non-scratch plastic jaws. Some of the beads will resemble pots and liquid containers for ancient through colonial 25/28mm gaming. 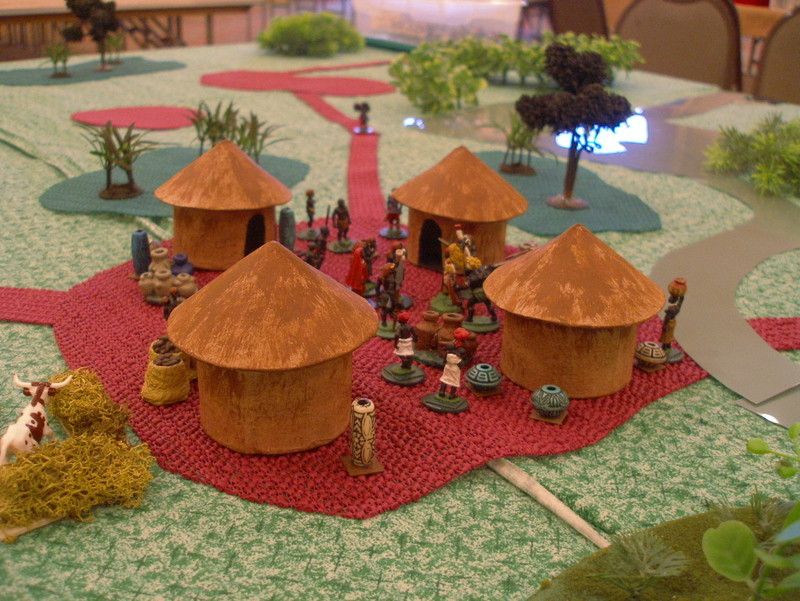 I have a small number of them for my colonial gaming, as seen in this village picture. Drop pins of 50mm length are useful for replacing pikes spears flag poles etc. I have bought quartz and geodes useful for terrain. Some beads for scratchbuilding and a trinket or two to keep SWMBO tolerant of my huge junk pile. Beads for scratchbuilding, faux coins for shields, decorations for buildings. At one convention, I found a prehistoric Venus statuette to use as a fertility goddess for my cavemen.